It’s not often you get to live your dream. On February 23rd, National Men’s Day here in Russia (also known as Defender of the Fatherland Day) I get to realize mine. As an editor with wanderlust and an adventurous alter ego, I will join one of the off-road teams and embark on a two-week expedition across the eastern wilderness of Russia. I promise some thrills and excitement along the way. On February 23rd, dozens of adventure enthusiasts will commence a 10,000-mile journey by jeep across Russia’s frozen wilderness. The off-roaders will scale Eurasia from Murmansk on the Arctic Sea to Vladivostok on the Pacific Ocean in 15 days, roughly following the path of the world’s longest railway, the Trans-Siberian Express. 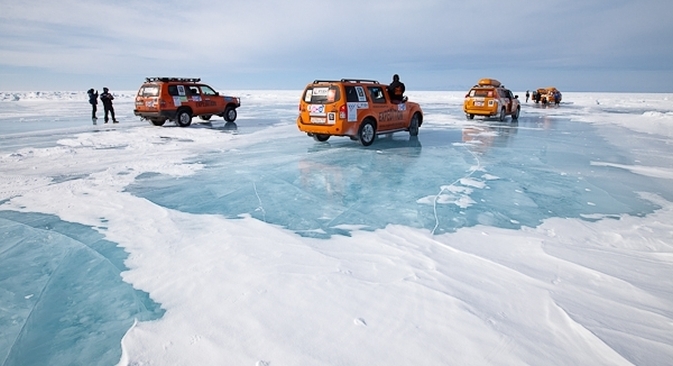 Fifteen teams will compete for the grand prize awarded to the fastest and most skilled at maneuvering their off-road vehicle across the tundra in subzero temperatures (and completing a dash across frozen Lake Baikal). RBTH Executive Editor Artem Zagorodnov will be on-site and en route to report. You can follow him here. I’m not always behind my desk. I have prepared for this odyssey by taking some fairly exotic and challenging road trips in the past few years, to places as far flung as Australia, Chile and Alaska. In fact it was in Alaska that I flipped our car on the treacherous Haul Road and had to be rescued from the tundra by friendly truck drivers (I’m counting on better luck this time). However nothing I’ve experienced so far compares to the distances and driving conditions of this undertaking: Ten thousand miles across Russia and Kazakhstan, from Murmansk to Vladivostok, and Europe to Asia... Only a third of the way will be on the Russian equivalent of Interstate highways, with the remainder on deliberately difficult, unpaved roads or no roads at all. The point? The winning team will receive $100,000 from the organizers (the Ruyan company…more on them later), but I doubt that money is the primary motivation. Many sign up for the shot of adrenaline to the heart, the life enrichment... and, can you imagine, the great stories? Some folks just like to spend time in the mud, looking at the stars. Over the course of the journey each of the 15 teams will be given challenging drives to complete between designated destinations on the map. For extra points, drivers can choose whether to compete over especially treacherous terrain. The most daring team with the most points will win. Dating back to 2005, teams from the United States, Germany and many other countries have participated. This year’s newest international contestants come from Poland and Moldova. For around half of the competing teams this is corporate teambuilding, sponsored entirely by their employers. As a journalist, I have to stay out of the way and observe (No helping or hampering allowed) as I hitch rides along with way with different teams. One of the rules this year is that each team must include at least one woman. The word from the teams is that the men apparently improve their hygiene and curse less in the presence of a woman. Nearly any type of vehicle (up to three are allowed per team) is accepted, with one group having gotten approval for an armored personnel carrier; most cars are Jeeps, Toyotas and Russian-made Nivas. Local law enforcement along the route has promised to assist in any way possible, but will also be keeping a watchful eye on participants obeying traffic rules (or so we were told). What other safety precautions will be taken? At least two vehicles must stick together (no solo joy rides); each car must have a medical kit and radio. The Ministry of Emergency Situations is poised to assist if necessary (they have helicopters and god knows what else on standby). So, I’m gearing up for this new frontier. As revered cosmonaut Yuri Gagarin, once said, Poehali! Let’s go!